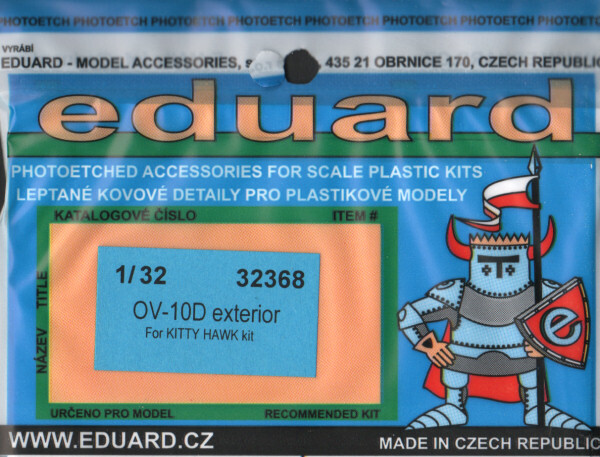 In this release, Eduard has focused on the airframe of the OV-10D kit with two frets of photo-etched detail parts. This set includes new details for the nosewheel well, main gear wells and the interiors of the respective gear doors. In many cases the details are subtle in that they add rivet details to the inside walls and bulkheads but for the AMS modeler, that is a big improvement over blank plastic especially when these areas are enhanced with washes and weathering. In addition, the dorsal fuselage hump is given structural details to enhance the mount as well as the 'disco light' infrared jammer. The landing gear is likewise enhanced with brakelines and oleo scissor detail that can't be replicated in styrene. The undersides of the external stores pylons also receive appropriate details and even the AIM-9 rails receive similar overlays to render realistic detailing. This set provides filler and inspection caps for the external fuel tanks as well as for the napalm cannisters. The ends of the rocket pods also receive overlays to provide needed details as well. The sides of the twin tail booms receive revised chaff/flare launcher panels.